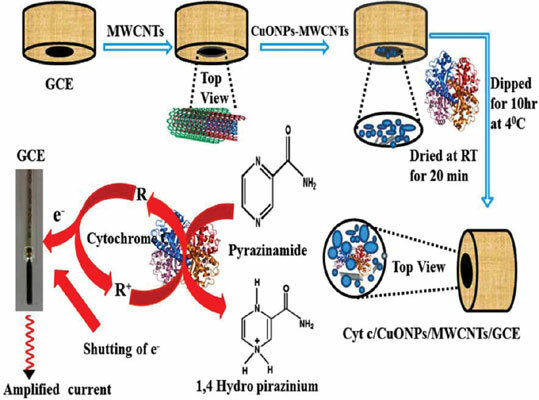 Background: A simple and novel electrochemical sensor was developed for the determination of pyrazinamide (PZM) in various pharmaceutical samples. The sensor was developed by modifying the glassy carbon electrode (GCE) in 3 different stages; GCE modified with multi walled carbon nano tubes MWCNTs (GCE/MWCNTs), further it was coated with copper oxide nanoparticles (CuONPs). Finally Cytochrome c (Cyt c) was immobilized on the surface of the pre-coated electrode. Cyclic voltammry and differential pulse voltammetric techniques were employed for the electrochemical investigations. The CV results obtained showed well-defined anodic and cathodic peaks at the peak potentials -0.77 V and -0.80 V respectively, and also revealed good electrocatalytic activity of Cyt c/CuONPs/MWCNTs/GCE towards PZM. From the measured DPV results, the limit of detection and limit of quantification of the developed sensor were calculated, and found to be 0.0038 µM and 0.0129 µM respectively. Furthermore, the proposed sensor was successfully applied to the analysis of PZM in the various commercial pharmaceutical samples. Pyrazinamide (PZM) is an antimycobacterial and a chief component of multidrug therapy for tuberculosis (TB). It is crucial for the prevention or treatment of TB infections. PZM has become an important component of short-term (6 months) multiple-drug therapy for tuberculosis. Owing to the high medical significance of PZM, it is necessary to develop a simple and rapid methodology for the analysis of PZM in various pharmaceutical is crucial. Ectrochemical methods with modified sensors have been exhibiting greater advantages in the current progressive scientific world. In the present manuscript a novel high sensitive electrochemical sensor was developed for the determination of PZM in various pharmaceutical samples. The developed sensor shows realistic behaviour towards pharmaceutical samples which is successfully monitored and tabulated in the present work. Methodology: Voltammetric measurements were carried out with 797 VA Computrace system with version 1.3.1 software from Metrohm (Switzerland). PZM stock and standard solutions were made with 0.1 M phosphate buffer solution (PBS). The CuONPs were synthesized according to the previous report with slight modification. Electrode modification was performed in three different stages with MWCNTs, CuONPs and Cyt c to develop the finalized sensor. 10 ml of the PBS (pH 7) was introduced into the electrochemical cell. Thereafter a bare and modified GCE was dipped into the electrochemical cell followed by purging nitrogen gas for about 10 min and then the CV/DPV experiment was performed. An aliquot of the PZM solution was then introduced into the electrochemical cell, at 1000 rpm of rotating disc speed and the optimized pre-concentration potential was fixed for the voltammetric measurements. The cyclic and differential pulses voltammograms were monitored at the scan rate of 0.1 V s-1 with the potentials increasing towards the positive direction. In addition the real pharmaceutical samples were also analysed via standard addition method. Results: Infrared spectroscopy and X-ray diffraction study characterization reveals the confirmation of formed CuONPs. Transmission electron microscopic studies confirmed the surface characterization of finalized sensor. Additionally, thermogravimetric analyses support the confirmation of the formed nanocomposite coated on the surface of GCE. Randles-Sevick equation reveals the high surface area of the modified sensor. This indicates the development of a suitable platform for electrochemical redox mechanism of PZM on the surface of the final sensor. The utmost electrochemical parameters like pH, scan rate, and deposition time were optimized. The developed sensor showed enhanced electrochemical sensing peak currents in cyclic voltammetry. The differential pulse voltammetry showed the linear range 3-30 µM with good LOD and LOQ of 0.0038 µM and 0.0129 µM respectively. The developed sensor showed good percentages of recovery viz., 99.5% and 98.2% respectively. Conclusion: In the present work the developed sensor showed good catalytic activity towards PZM, due to the increased electrochemical sensing mechanism for PZM. The modified electrode was successfully characterized by the TEM, FT-IR, TGA and XRD techniques. The fabricated sensor showed enhanced peak currents and low detection limits with PZM. The proposed sensor showed excellent sensitivity, selectivity and low detection limits. In addition the developed sensor was applied for the determination of PZM in real pharmaceutical samples, and reflects good recovery percentages. It is evident that the proposed method will serve as a standard protocol for the determination of PZM in various pharmaceutical samples, and would be of great help to pharmaceutical industries in the future. An electrochemical sensor, pyrazinamide, cyclic voltammetry, different pulse voltammetry, pharmaceutical samples, glassy carbon electrode (GCE).